Nursing homes, also known as old people's homes, care homes, rest homes, and convalescent homes, provide residential care for elderly or disabled people that often includes around-the-clock nursing care. Often these terms have slightly different meanings in the same or different English-speaking countries to indicate that the institutions are public or private or provide mostly assisted living or more or less nursing care and emergency medical care. A nursing home is a place for people who do not need to be in a hospital but cannot be cared for at home. The nursing home facility nurses have the responsibility of caring for the patients medical needs and also the responsibility of being in charge of other employees, depending on ranks. Most nursing homes have nursing aides and skilled nurses on hand 24 hours a day. Some nursing homes also provide short-term rehabilitative stays following surgery, illness, or injury. Services may include physical therapy, occupational therapy, or speech-language therapy. Nursing homes also offer other services, such as planned activities and daily housekeeping. Nursing homes may also be referred to as convalescent care, skilled nursing or a long-term facility. Nursing homes may offer memory care services. Poorhouses/workhouses were the first implemented national framework to provide a basic level of care to the old and infirm. 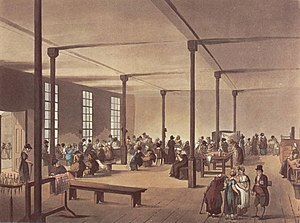 Pictured, is "The workroom at St James's workhouse" from The Microcosm of London (1808). Starting in the 17th century, the concept of poorhouses (also referred to as almshouses) were brought to America by English settlers. All orphans, mentally ill and the poor elderly were placed into these living commons. In the twenty-first century, nursing homes have become a standard form of care for the most aged and incapacitated persons. Nearly 6 percent of older adults are sheltered in residential facilities that provide a wide range of care. Yet such institutions have not always existed; rather, their history and development reflect relatively recent demographic and political realities that shape the experience of growing old. Before the nineteenth century, no age-restricted institutions existed for long-term care. Rather, elderly individuals who needed shelter because of incapacity, impoverishment, or family isolation often ended their days in an almshouse. Placed alongside the insane, the inebriated, or the homeless, they were simply categorized as part of the community's most needy recipients.These poorhouses gave a place where they could be given shelter and daily meals. Poorhouses continued to exist into the early 20th century despite the criticism they faced. Much of the criticism stemmed from the conditions of the poorhouses. The Great Depression overwhelmed the poorhouses as there were a lot of people that needed help and care but not enough space and funding in the poorhouses. Due to Muck Raking in the 1930s the less than favorable living conditions of the poorhouses were exposed to the public. Poorhouses were then replaced with a different type of residential living for the elderly. These new residential living homes were called board-and-care homes or also known as convalescent homes. These board-and-care homes would provide basic levels of care and meals in a private setting for a specific fee. Board-and-care homes proved to be a success and by World War 2, the new way of nursing homes began to take shape. As the times continued to change, the government identified the issue of people spending extensive amounts of time in hospitals. To combat these long stays in short-term settings, board-and-care homes began to convert into something more public and permanent that was state and federally funded. From this, by 1965 nursing homes were a solid fixture. 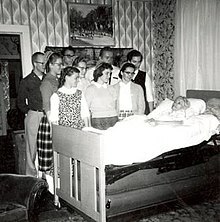 Nursing homes were a permanent residence where the elderly and disabled (poor elderly and disabled specifically) could receive any necessary medical care and receive daily meals. Though nursing homes in the beginning were not perfect, they were a huge step above almshouses and poorhouses in regards to following laws and maintaining cleanliness. From the 1950s through the 1970s the dynamics of nursing homes began changing significantly. 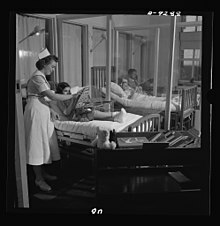 Medicare and Medicaid began to make up much of the money that would filter through the homes and the 1965 amendment laws enforced nursing homes to comply with safety codes and required registered nurses to be on hand at all times. Additionally, nursing homes may sue children for the costs of caring for their parents in jurisdictions which have filial responsibility laws. Later in 1987, the Nursing Reform Act was introduced to begin defining the different types of nursing home services and later added the Residents' Bill of Rights. Today nursing homes are very different across the board. Some nursing homes still resemble a hospital while others look more like a home. Nursing home residents can pay for their care out of pocket, others may receive medicare for a short time and some may use long-term insurance plans. Across the spectrum, most nursing homes will accept medicaid as a source of payment. Abuse on elderly patient occurs all over the united states. There are 3 major abuses reported in nursing homes physical, emotional, and sexual abuse. Physical abuse is the intention or action to hurt an elderly person resulting in scars and bruising. Emotional abuse occurs when a employee makes verbal threats and continuously degrades the patient, resulting in the patient experiencing mood swings, anxiety, and depression. Sexual abuse is when an elderly patient is being forced into unwanted sexual activity by an employee, resident or visitor, usually attempted and reported when the patient is sleeping, sick, or weak. Nursing home neglect is similar to elderly abuse, employees began to repeatedly ignore and leave patients alone, employees began to neglect the patients personal hygiene like bathing and brushing their teeth, employees refuse to provide the patient a reasonable about of food and water, and the employee neglects to Provide the patient with the correct amount of medication they require. All of the nursing homes employees are all required to be licensed or uphold a certificate in the state of which they work. In most Facility's, nursing homes are required to provide enough staff to adequately care for residents. In the U.S., for instance, nursing homes must have at least one registered nurse (RN) available for at least 8 straight hours a day throughout the week, and at least one licensed practical nurse (LPN) on duty 24 hours a day. Direct care nursing home employees usually include registered nurses, licensed practical nurses, certified nursing assistants, and physical therapists, amongst others. A nursing assistant provides basic care to patients while working directly under a LPN or RN. 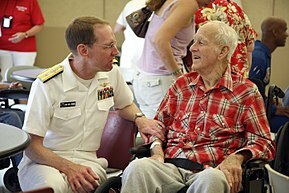 These basic care activities, also referred to as activities of daily living, can include assisting with bathing and dressing residents, helping residents with meals, either serving them or with feeding, transferring to and from the bed or wheelchair, making and cleaning beds, assisting with toileting, and answering call lights. Nursing assistants' official titles can vary between jurisdictions and facilities. They can include Certified Nursing Assistants (CNA's), nursing aides, caregivers, patient care associates, patient care technicians, and care assistants. Depending on the size of the nursing home, a nursing home may have either a nursing home administrator or an executive director. Some nursing homes may have both, but their job duties are similar and can include overseeing staff, supplying medical supplies, and financial matters. Some nursing homes also have human resources personnel, who are in charge of all aspects of hiring new employees. Human resources job duties vary but can also include coordinating payroll, organizing orientation programs for new employees, interviewing, disciplinary actions, and ensuring compliance with federal and state laws. Nursing homes are usually licensed and heavily regulated under governing legislation. Compliance with the federal and state legislatures are reviewed regularly for adherence to strict standards of building codes, care plans, behavior and altercations between residents, nutrition and dietary services, medical services, nursing and personal care, religious and spiritual practices, pets, and recreational programs. Housekeepers perform the everyday duty of cleaning and keeping up nursing homes. Housekeepers play a huge part in ensuring that nursing homes are kept clean and free of disease causing agents. 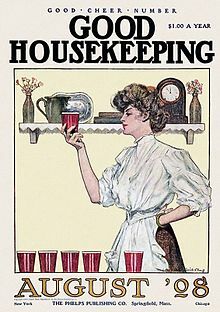 Housekeepers have a long list of duties which include cleaning floors, changing linens, disinfecting bathrooms, changing towels, washing clothes, emptying garbage cans, sanitizing rooms, replenishing supplies, dusting and polishing furniture, vacuuming, and keeping windows and woodwork clean. These duties can be different from facility to facility but will overall include basic cleaning. Housekeeping does not require any licensure or schooling, but some housekeeping jobs may prefer prior job experience. Recreational staff usually include an activity director and possibly activity assistants depending on the size of the nursing home. Activities aim to meet each residents' emotional, intellectual, physical, social, spiritual, and vocational needs. The transition from being independent to having to depend on others and be away from home is oftentimes very difficult, which is why activities are important to combat depression and anxiety. Some of the different activities that may be offered include hosting birthday parties, celebrating holidays, book clubs, musical events, outdoor activities, discussion and social groups, exercise, arts and crafts, pet therapy, religious services and community outings. Volunteer involvement is also an important part of nursing home activities given that volunteers can act as a link between the nursing home and the outside community. One of the many services offered in a nursing home is occupational therapy. Occupational therapy may be necessary following an injury or illness in order to regain skills and to receive support during any physical or cognitive changes. Occupational therapy will focus on activities of daily living such as bathing, dressing, grooming. Occupational therapy also assists with instrumental activities of daily living which include home and financial management, rest and sleep, education, work, play, leisure, and social participation. Occupational therapists work to allow the person to safely and comfortably reintegrate into society by practicing public dining, transferring to different surfaces (chairs, beds, couches etc. ), and will assess the need for any home modifications or safety equipment to ensure a proper and safe transition. When a cognitive and/or perceptual deficit is presented, therapists will work with the person by teaching strategies to maximize memory, sequencing and attention span length. Speech-language pathology is another service found in a nursing home. Speech language pathologists specialize in working with those who have a difficult time with language and/or speech, usually following an injury or an underlying diagnoses. The SLP will evaluate the persons speech. If the person is having trouble with speech, this points to an issue with coordinating the movements and muscles used to produce speech. 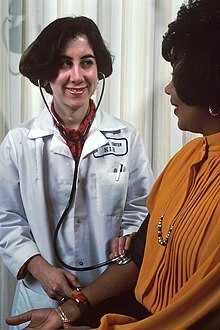 While trouble with language points to the person having difficulty with understanding what they are hearing and seeing. The SLP will also look at difficulty with swallowing food and will evaluate the person in order to figure out which part of the swallowing process is not working. Some of the many speech disorders worked with by the SLP are; Phonology meaning the speech patterns used, Apraxia meaning difficulty with coordinating the movements needed to make sounds, Receptive Language meaning difficulty understanding language, Fluency meaning stuttering, Expressive Language meaning difficulty using language and many other disorders. ^ "Types of Care Facilities". Care givers library. ^ Esposito, Lisa (1 June 2016). "What Nursing Home 'Memory Care' Means". U.S. News & World Report. Retrieved 29 July 2017. ^ Watson, Sidney D. "From Almshouses to Nursing Homes and community care: Lessons from Medicaid History". Georgia State University Law Review. 26. ^ "History of Nursing Homes". SeniorAdvisor.com. ^ "Paying for Nursing Home Care". Medicare.gov. ^ Perkins &, Paul (14 June 2013). "Nursing Home Neglect - Prevention, Signs & Types of Negligence". Nursing Home Abuse Guide. Retrieved 18 April 2019. ^ "nursing home staff". skillednursingfacilities.org. Retrieved 12 October 2012. ^ "What Nurses Do". American Nurses Association. ^ Perkins &, Paul (14 June 2013). "Types of Nursing Home Employees - Types, Requirements & Licenses". Nursing Home Abuse Guide. Retrieved 16 April 2019. ^ "What You'll Do As A CNA". AllNursingSchools.com. ^ "Job Description of Senior Living Housekeeper". Work.Chron.Com. ^ Petrea, RN, Jennifer. "Importance of Being Social in a Nursing Home". McKnights. ^ "About Occupational Therapy". AOTA.org. ^ "Occupational Therapy's Role in Skilled Nursing Facility's" (PDF). AOTA.org. ^ "How Do I Know if I Should See a Physical Therapist". BayStatePT.com. ^ Ling, Shari M. (13 October 2011). "Rehabilitation of Older Adult Patients with Arthritis". Johns Hopkins Arthritis Center. Retrieved 29 July 2017. ^ "Physical Therapy". University Hospitals. St. John Medical Center. Retrieved 29 July 2017. ^ "Speech Language Pathology in Long Term Care". SpeechPathology.com. ^ "What is a Speech Language Pathologist?" (PDF). superduperinc.com. ^ "NHS Continuing Healthcare, NHS funded healthcare and intermediate care," (PDF). Age Concern. August 2007. ^ Compare Care Homes Advice. "'Funding a Care Home' – a comprehensive financial guidance leaflet from Comparecarehomes.com" (PDF). Retrieved 1 March 2010. ^ "Dilnot Commission on Funding of Care and Support". Age UK. Retrieved 28 April 2013. ^ "ltcontinuum". fullcirclecare.org. Retrieved 12 October 2012. ^ "Nursing Home Inspections". medicare.gov. Retrieved 12 October 2012.